TS SSC pre final exams Time Table, Telangana SSC/10th Class pre final exam Time Table: TS/Telangana SSC 2019 pre final examinations Time Table: Telangana SSC exams Time Table, #TS SSC 2019 pre final exams Time Table, bsetelangana ssc 2019 time tables, Directorate of Government Examinations, 10th Class SSC pre final examinations 2019 Time table, schedule. 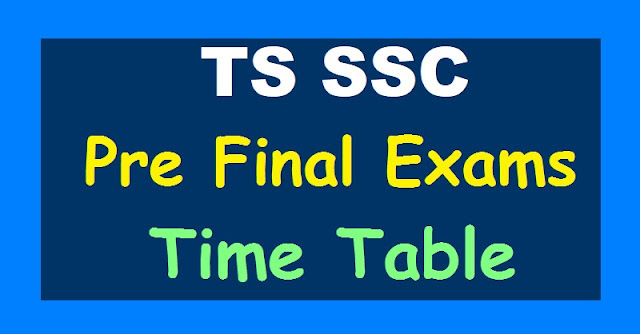 The Telangana State Board of Secondary Education has announced that the SSC pre final examinationswill begin in February month, 2019. Sub:- Conduct of Pre-Final Examination for Class X on 16-2-2019 afternoon - Orders - Issued - Reg. All the District Educational Officers in the State are hereby informed that as per Academic Calendar communicated, the Summative Assessment (SA)-II is scheduled from 30-03-2019 to 08-04-2019 for classes I to IX and the pre-final exams for class X from 15th to 27th February, 2019. In this regard, time tables are communicating with instructions for conduct of Summative Assessment (SA)-II and Pre-final examinations and valuation of answer scripts..
4. Recording results and parents meeting on 11.04.2019 and issue the progress report to children. 5. Students resubmit the progress report to school after parents signature - 12.04.2019. Therefore, the DEOs are requested to give necessary instructions to the schools on conduct of Summative Assessment (SA)-II, valuation of answer scripts and issue of Cumulative Records which shall be completed in all aspects by 12.04.2019. Sub: School Education - Telangana Hyderabad - Re-scheduling of pre final examinations - Orders issued - Reg. examinations. However keeping in view of fixing the schedule of SSC examinations from 14th_ March it is proposed to re schedule the pre final examinations for class X from 16.02.2019 to 28.02.2019. The daily schedule is given here under:.. suggestions on how to write and improve the answer for the given questions. The exam to be conducted between 10.00 AM to 12.30 PM and the afternoon time shall devoted for explanation and doubts clarification on the next day examination subject. Therefore, all the DEOs are directed to take immediate action and inform to all the Headmasters of High Schools of both Government and Private managements in the districts. All the DEOs further informed that, it came to the notice that many private school management are not following the academic calendar issued for the year 2017-18 and all the schools recognized by Government of Telangana shall follow the academic calendar. However some managements are conducting SA1, SA2 and SA3 i.e. and more number of unit test which causes much strain and stress on the part of the students. More time need to be devoted for transacting the syllabus and class room discussions rather than increasing the number of examinations. The State team shall visit the schools and observe implementation of academic calendar and other deviations if any. Therefore, all the RJDSEs and DEOs are requested to focus on the above issues and see that smooth conduct of pre final examinations as per the schedule as above and also see that all private school management shall follow the academic calendar scrupulously.